What’s better than going to a Penguin’s game? How about watching it at a private viewing party with former Penguins? 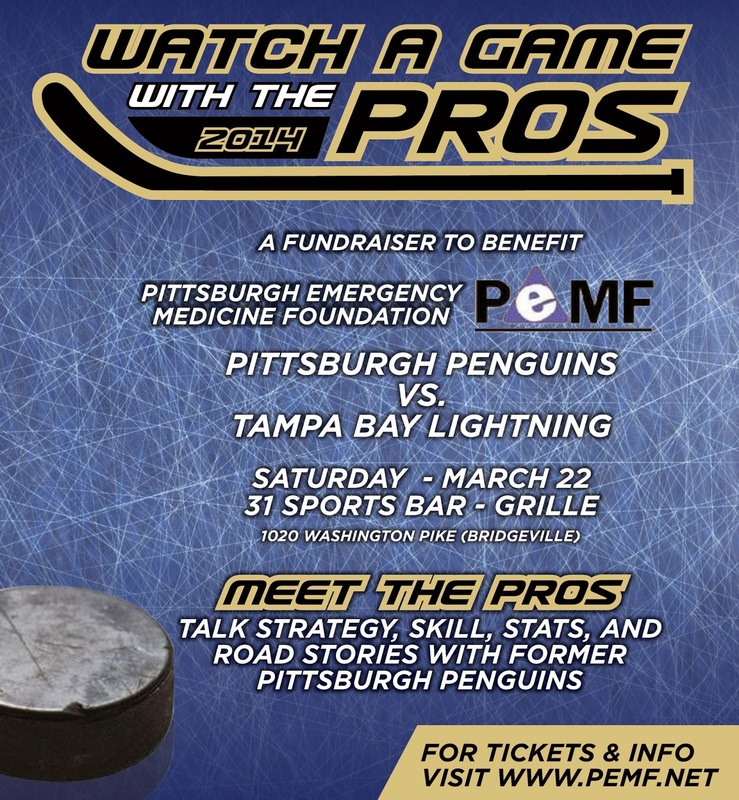 On March 22, the Pittsburgh Emergency Medicine Foundation is hosting "Watch The Game With The Pros" at 31 Sports Bar and Grille, Bridgeville, PA. The Pens will be playing at home versus Tampa Bay Lightning that afternoon. This event will feature Pittsburgh Penguins Alumni, including former Stanley Cup winning goalie, Ken Wregget, NHL Hall of Famer and 6-time Stanley Cup Champion, Bryan Trottier. Also expected to be on hand is Pittsburgh's own, Dave Hanson, one of the Hanson Brothers from the 1970's movie, "Slapshot"
This is your chance to interact with the pros: talk game strategy, talk stats, hear old war stories of the road and locker room, take photos and get autographs and have a few laughs while cheering on the Pens, all while supporting a great cause. The Pittsburgh Emergency Medicine Foundation (PEMF) is an autonomous charitable foundation formed to foster the academic and research programs of the University of Pittsburgh Affiliated Residency in Emergency Medicine and the Center for Emergency Medicine of Western Pennsylvania. PEMF is committed to providing financial support for research and educational endeavors in the field of emergency medicine. 31 Sports Bar and Grille, owned and operated by Penguins Alumni, Ken Wregget and his wife Cindy, has offered a cash bar and a buffet style menu including sliders, poutine, wings, reuben eggrolls, mozzarella, Buffalo chicken dip, onion rings. The CASH BAR will include Miller Lite specials. General Admission Tickets are only $25.00. >> TICKETS << This is a must-attend event. It starts at noon and continues until the game ends. Break out of the winter dole-drums by attending a fun event that benefits an important cause.